A centrally located second floor TWO BEDROOM apartment (in need of some refurbishment). 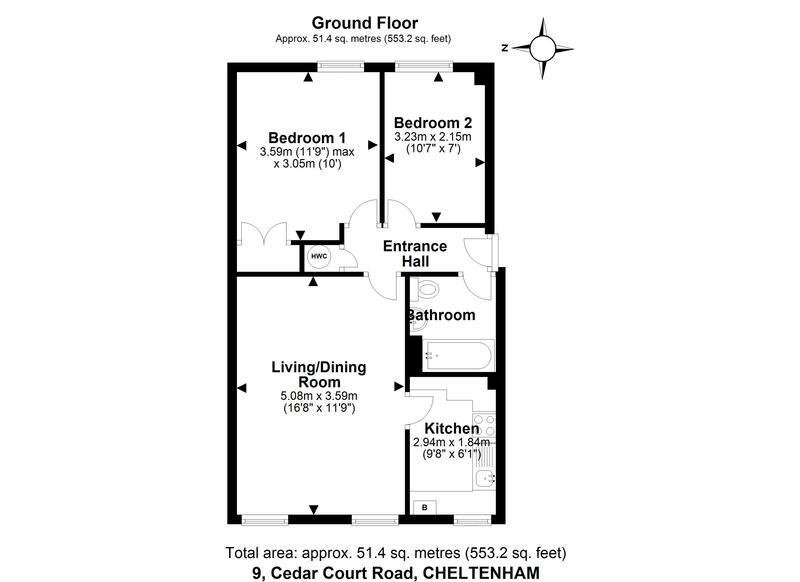 The accommodation comprises (via communal entrance, stairs to second floor, landing with own door to flat) entrance hall, living / dining room, kitchen, bathroom with electric shower over bath, two bedrooms and allocated parking space. The property benefits from replaced double glazed windows and gas central heating. The Situation: The property is bordering the St. Luke’s vicinity found by us to be most popular, situated on the “edge” of the Town Centre, thereby giving easy access to the main shopping facilities. The property also enjoys a position close to Sandford Park. Cheltenham General Hospital and Cheltenham College are also nearby whilst the Montpellier and Leckhampton districts are both around half a mile away only. Directions: Leave Cheltenham Town Centre on the A46 Bath Road (heading South from “Sainsburys” end); pass Oriel Road on the right, and Cedar Court Road is the third turning on the left. The communal entrance to Flat 9 Cedar Court (front block) is found by making the first left turn in Cedar Court Road. Communal entrance with buzzer entry system and stairs to all floors. Fitted with a basic old range of wall and base units with work surfaces over, stainless steel single drainer sink unit, space and plumbing for washing machine, space for free standing gas oven, wall mounted gas boiler, double glazed window and radiator. Suite comprising panelled bath with electric shower, shower pole and curtain over, wash hand basin, extractor fan, w.c. and radiator. This apartment comes with an allocated parking space. Service charge - 1/4/19-30/6/19 per quarter is £245.31 plus the quarterly reserve fund £60.25 so in total £305.56. The freeholder is Cedar Court (Cheltenham) Residents Association Limited of 94 Park Lane, Croydon, Surrey, CR0 1JB. 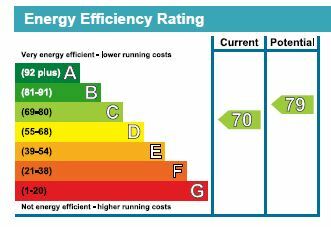 We are informed by Cheltenham Borough Council that the property is in Band ‘B’ with £1,363.66 being payable for 2018/2019.